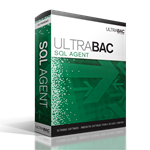 The UltraBac SQL Agent allows local and remote backups of live, operational databases without shut down. This is a required UltraBac option for 24x7 operation. The agent uses Microsoft SQL APIs for fast and reliable full & incremental database dumps. Provides recovery of a database to its original location or restoration to a new location, and SMTP email notification.